Let me get this out first. I am a rice girl. When given the choice, I will always pick rice over noodles. But while I love rice, I’m a rice addict rather than a connoisseur. With instant noodles, I’m a connoisseur. Instant noodles must be one of the world’s most accessible foods. A true “just add water” food and popular the world over. According to Wiki, “As of 2010, approximately 95 billion servings of instant noodles are eaten worldwide every year.” That is an average of at least one serving a month for every person on earth. Impressive. I’ve eaten noodles for breakfast, morning tea, lunch, afternoon tea, dinner and as a midnight snack. Not all in one day mind you! Noodles are eaten at any time of day all over Asia and while breakfast noodles may seem odd to some people, served in a mild broth, it can be the perfect way to start a day. The first meal I ate when we arrived in Vietnam on a wintery January morning was an eel noodle soup. It was a was cheap, warming and filling. Noodles can be used as an ingredient in a noodle soup with strips of beef, pork, chicken or fish and pieces of fresh vegetable like bok choy. I’ve even simmered raw bacon pieces in soup. Some people add a fried egg on top or poach an egg very gently in the soup. Yum. I mostly make instant noodles for a snack. I always keep a pack or two at my desk as “emergency noodles”. A good noodle should be firm and springy when cooked but never spongey. Instant noodles are usually softer than I like but as long as the texture is right, I can forgive a slightly less firm noodle. The texture must silky smooth. I do not like spongey, floury or gritty noodles. I grew up with instant noodles or what is known in Hong Kong as Gong Je Mein which translates to doll noodles. This name has been around for half a century and comes from the mascot for a popular brand of instant noodles: Nissan Noodles. Today in Hong Kong, all instant noodles continue to be called doll noodles regardless of if they are Nissan Noodles or not. Kind of like how tissues are called Kleenex in the U.S. regardless of brand. I’m not sure if this Nissin mascot is the original namesake doll from the 1960s, but it’s it is the character grew up with and recognise as the instant noodle doll. I still buy Nissin noodles these days as I like the depth of flavour and the texture. They’re usually more a meal noodle than a snack noodle. Do you drink the soup that comes with your noodles or do you leave the soup behind? There are lots of noodles that don’t have drinkable soup. They are often too salty. If a soup is too salty to drink, it usually turns me off that brand. I want to drink the broth! This is no way a comprehensive guide to noodles. They are simply the noodles that I keep buying because they taste good to me. I’ve eaten a lot of noodles in my time and I’m pretty sure I’ve tried all the different kinds available at my local supermarket. The standard size for instant noodles seems to be 85 grams. There seems to be a few consistently popular brands in everyone’s pantries but I often get the feeling that I’ve had too much salt and MSG. So if I’m at home, I’ll use half or none of the default seasoning and add some chopped vegetables and/or meat to make it more of a meal. Luckily, there is an MSG free brand out there and they’re delicious. No MSG! My favourite are Koka Mushroom flavour noodles. I always drink the soup when I have these. Every last drop! The flavour is earthy and savoury like dried mushrooms. It is delicious and a bonus are they are vegetarian friendly and have no MSG. I know instant noodles aren’t exactly a health food, but given the option, I’d pick these ones. Think of these as less bad for you. I can’t find this flavour in my local stores after they disappeared from both my local supermarket giant and my local Asian supermarket. I’m hanging out! 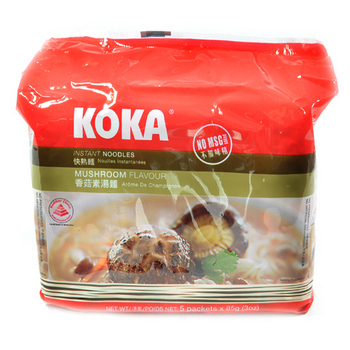 If anyone sees Koka Mushroom Flavour noodles or know of a good alternative, please please please let me know. The Laska and Tom Yam flavours can be found in most supermarkets and are good, but not quite as good (or unique) as the mushroom one. I ate a lot of Yum Yum noodles when I was a student as they are one of the cheapest around. The 60 gram pack are substantially smaller than the others which can be a false economy as you may require 2 packs. I was addicted to the duck flavoured ones but the shrimp (tom yum) ones are also good. These come with a flavoured oil sachet. Quite salty and a bit sweet. Mi Goreng noodles are really popular here and the point of difference is they are drained of water and seasoning and sauces mixed in while hot. With more packs of seasoning than other brands, it’s encouraged to mix and match the condiments to your personal preference. Can be a bit oily so use the oil sparingly. Kecap manis or Indonesian sweet soy sauce gives these a lovely sweet flavour. Spicy Thai Chicken Coconut Noodles. What a name. These are basically Tom Ka Gai and this is a soup I would drink. The noodles aren’t amazing, a bit soft for my liking, but the flavour is good. These really are spicy so don’t add all of the chili packet unless you enjoy eating fire. I ate a lot of Yum Yum and Indomie noodles in the past, and still have backup packets of these in the pantry. My favourite are Myojo (Singapore) Chicken and Abalone and Toyko Soy Sauce. I haven’t seen them in Auckland, but they are sold at Kosco in Christchurch. I’ve never tried Koka but will look out for them. Thanks! I will keep a lookout for Myojo. I seem to like Singapore noodles.